Two years ago, we debuted the Overwatch World Cup, and 2017 saw it evolve and expand further. Now it’s time to announce the return of this global celebration of high-level play: the 2018 Overwatch World Cup, which culminates this November in Southern California. Here are all the details for how to get involved. Qualification: From today through the end of Competitive Season 9 (April 28), we’ll be tracking the average skill rating (SR) of each country’s top 150 players. Each country’s progress can be tracked on the Overwatch World Cup website. The top 20 countries at the end of this period will be invited to compete in the 2018 Overwatch World Cup. This year, the four Group Stage host countries will be France, South Korea, Thailand, and the United States. These countries will automatically qualify into the tournament, resulting in a total of 24 teams. If a host country makes the top 20 through average SR, the 21st-ranked country will take their spot—and so on. Committees: This year, we are changing how qualified countries’ National Competition Committees are formed. Each will be comprised of three people: a GM, a coach, and a community lead. * Members will be compensated for their time and effort, along with travel and accommodations required to support their teams during the Group Stages and Finals. These committees will be built via the following process, across Phase 1 (May 1–14) and Phase 2 (May 17–29). Full National Competition Committees will be revealed on May 31! Players: Committees will hold tryouts from June 1 through July 5. Players—including Overwatch League members!—can compete for a spot on the team of their country of citizenship. Committees will submit rosters, which may contain up to 12 players, from June 15 through July 5. 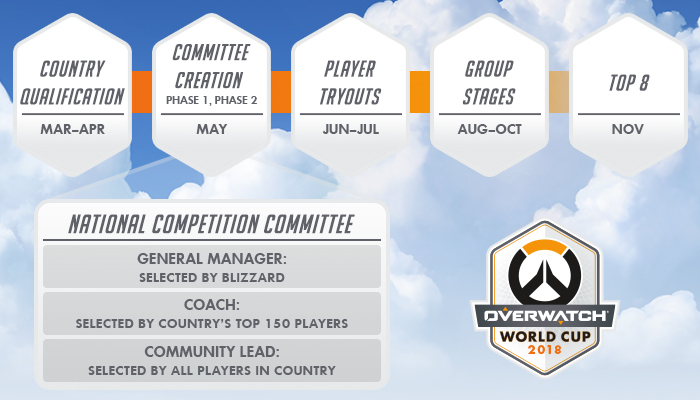 * Blizzard will work with the players and committees to identify seven players from each roster who will travel to applicable live events. Follow @PlayOverwatch for our next update, when we open Phase 1 voting. For now, heroes, hit that Competitive Play card: through the end of the Competitive Season, you’re fighting for your country! *All committee members and players are subject to approval by Blizzard.